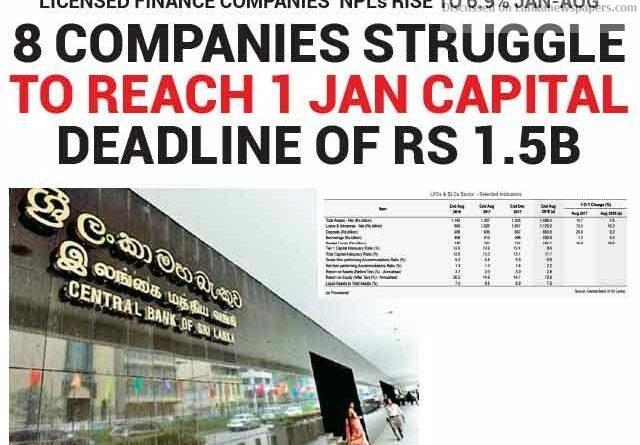 At least eight Licensed Finance Companies (LFCs) have to fulfil their Rs 1.5 billion minimum capital requirements by 1 January, a deadline imposed by the Central Bank of Sri Lanka (CBSL), CBSL officials told Ceylon FT.
“Those companies whose core capital and total risk-weighted capital ratios were below the minimum-required levels due to weak financial positions were required to take measures to rectify these issues. However, we have already given an extended time frame for a few companies and the remaining companies will settle their minimum capital requirement within the coming days,” they said. According to CBSL’s latest published data, Sri Lanka’s Licensed Finance Companies’ (LFCs) and Specialized Leasing Companies’ (SLCs) sector performance slowed further during the first eight months of this year, mainly due to high interest rates, moderate economic growth and natural calamities. Although capital and liquidity of the LFC and SLC sectors were at satisfactory levels, asset quality and profits witnessed a decline. The sector total regulatory capital levels improved by Rs 13.6 billion in August 2018, compared to the figures reported at end-2017, mainly due to the enhancement of the minimum capital requirement by the CBSL to Rs 1 billion from 01 January 2018, Rs 1.5 billion by 01 January 2019, Rs 2.0 billion by 01 January 2020 and Rs 2.5 billion by 01 January 2021. The sectors’ core capital and total risk weighted capital ratios decreased to 9.6 per cent and 11.1 per cent, respectively, at end-August 2018 from the reported levels of 12.4 per cent and 13.1 per cent, respectively, at end-2017. The sectors’ gross Non-Performing Loan (NPL) ratio increased to 6.9 per cent by end-August 2018 from 5.9 per cent reported at end-2017 mainly due to flood, country-wide drought and the slowdown in economic activity. This is the highest NPL ratio recorded since February 2015. The CBSL expects that NPLs will increase further due to extreme weather conditions and spillover effects of the Debt Relief Programme that was launched by the Ministry of Finance and Mass Media in August 2018. Profits of the LFC and SLC sectors slipped to Rs 15.5 billion during the first eight months of 2018, compared to the profit of Rs 17.6 billion in the corresponding period of 2017, as a result of the increased funding cost and increase in loan loss provisions. The annualized return on assets (ROA) and return on equity (ROE) ratios were at 2.8 per cent and 12.9 per cent respectively, by end-August 2018, compared to 3.0 per cent and 14.9 per cent, respectively, in the corresponding period of 2017. Several remedial measures have been taken by the CBSL to revive certain weak finance companies in this sector, while initiatives have also been taken for the resolution of insolvent companies. The LFCs and SLCs sector represents approximately 8.0% of assets of the Sri Lankan financial system and consists of 43 LFCs and 5 SLCs with a network of 1,355 branches. The sector recorded a growth of 3.8 per cent (Rs 51.4 billion) during the first eight months of 2018 reaching Rs 1, 406.7 billion, compared to 7.8 per cent growth reported in the corresponding period of 2017. “This was mainly as a result of low credit growth, decrease in the investment portfolio due to substantial sale of assets by a distressed LFC and a decline in liquid assets,” CBSL stated. Total liquid assets of the sector stood at Rs 110.9 billion at August 2018 with a surplus liquidity of Rs 21.7 billion against the stipulated minimum requirement of Rs 89.2 billion. The expansion of total assets slowed down, recording a growth of 3.8 per cent (Rs 51.4 billion) during the first eight months of 2018, reaching Rs 1. 406.7 billion, compared to 7.8 per cent growth reported in the corresponding period of 2017. “This was mainly as a result of low credit growth, decrease in the investment portfolio due to substantial sale of assets by a distressed LFC, and a decline in liquid assets,” CBSL stated. Credit provided by the LFCs and SLCs sector marginally grew by 6.4 per cent (Rs 67.9 billion) to Rs 1,125.0 billion in the first eight months of 2018 compared to the growth of 5.9 per cent in the corresponding period of 2017.